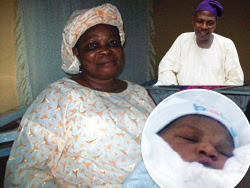 The families and friends of 52 year old teacher, Mrs. Olukorede Obamo and her husband, Moses Obamo, an accountant with Medexia Nigeria Limited are still celebrating the arrival of their new born baby that came 25-years after marriage. During the days she was searching for the fruits of the womb, Olukorode like other women in that predicament visited hospitals, herbal centres and countless other places to no avail. But the unexpected happened in February, 2012 when she miraculously conceived for the first time even though she found it difficult to comprehend her body chemistry at the initial stage. She later complained of her body reactions to her husband,thus, they headed straight to the hospital for pregnancy test. it was confirmed that she was indeed pregnant. In disbelief, they went to other hospitals for confirmation, but it was all positive. Thereafter, Olukorede started to nurture the pregnancy and nine months, precisely November 13, she was delivered of a baby girl. However, since the arrival of their bundle of joy, the entire residents turn their home into a sight-seeing arena. Expectedly, the Obamos threw a lavish party to celebrate the baby who was given more than 20 names, but the most striking of all the names is Obadunsin (It is good to serve God). Speaking with the press, Olukorede, said the birth of her baby had stirred up her trust in God and reinforced her belief in spousal love. she would not forget in a hurry the psychological trauma she went through during the trying times. According to her, “It was a tough experience; I did not find it easy. I am still in my husband’s house because God is with me. “We fought times without number but God settled us. My husband relations did not give me a breathing space; they always reminded me they needed a child. “Curiously, my husband and I went through a series of tests and the results were that nothing was wrong with the two of us. The visibly happy woman said she had registered for ante-natal at General Hospital, Ile Epo, Lagos, but she was eventually delivered by a nurse who is a pastor at Christ Apostolic Church in Ota, Ogun State. “The nurse used herbs for me in addition to prayers,” Olukorede said. Giving a word of advice to other women who find themselves in similar situation, the mother of one told them not to give up hope but have absolute confidence in God. The proud father of little Obadunsun, Moses expressed gratitude to God for wiping his tears. He said after years of marriage without any sign of conception, they started taking drugs. Ten years into their marriage, people had started calling them names, so he tried his ‘luck’ outside wedlock. This experiment produced two lovely children – a boy and a girl. “I was under serious pressure from some of my family members to divorce her. At a point, my people were divided on that because some of them really liked her because she is accommodating and caring. He also confessed that one thing that could not be taken away from his wife is her unwavering faith in God, stressing that she participated in all church activities, particularly those ones designed for the expectant mothers. Speaking on the possibilities of women to have children in their fifties, a gynaecologist, Dr. Ekunjimi Olanrewaju, said though it was not a common event, yet it was not impossible for a woman of Olukorede’s age to give birth to a baby.